Those monologues are over thanks to these two apps. You know how Shazam will give you the name of a song you like or can’t remember when you hold it up to the musical source? 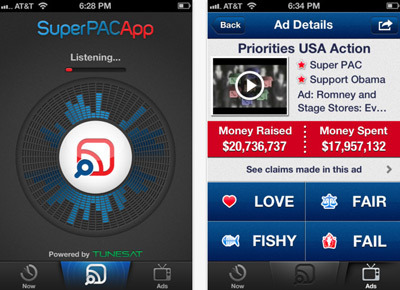 Well think of the Super Pac App as Shazam for political commericals. You download the app, then when a candidate’s commercial is on, you tap the app on your Iphone, hold it up to the television or radio source and the Super Pac App will instantly tell you who’s behind the television spot, how much they spent, what their objectives are and to what extent the ad’s claims are true. I LOVE IT! I wish they would hurry up and develop one for the Android. Right now it’s only available for the Iphone. 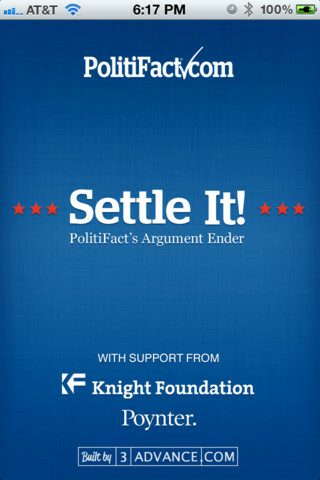 The second new political “You can’t handle the truth” app is called Settle It! PolitiFact’s Argument Ender. The next time you want to know about a specific Romney or Obama claim, just look it up by name, keyword or subject and get the straight story. This app is available free for both Iphone and Android platforms from the Pulitzer Prize winning Politifact.com. The app’s main feature is a search function that allows you to look up names and keywords. It’s ideal for settling dinner-table arguments or finding the facts after you see a campaign ad on TV. You can download it here.